Spanish National Day has become a battleground in Barcelona for some pro-Catalan secession demonstrators as they clashed with police on the sidelines of those who took to the streets calling for unity. 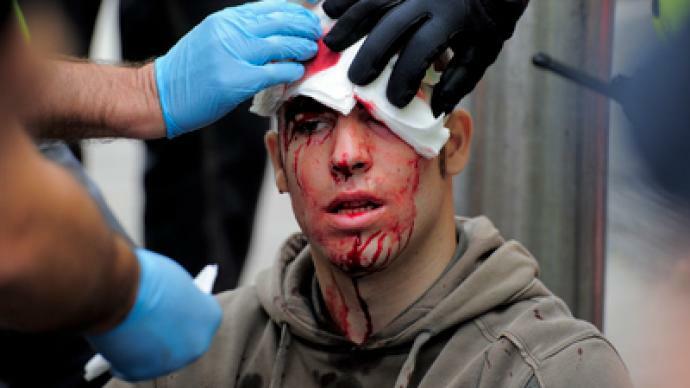 ­At least one person has been severely beaten by riot police, who used batons to separate the pro-Catalan activists from the National Day marchers. The Catalan nationalists verbally insulted the crowd of pro-unity activists, attacking them and trying to rip the national Spanish flag from their hands. 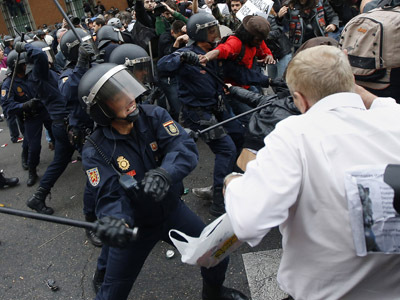 Some 800 police officers resorted to force to protect the peaceful march from the attacking Catalan nationalists. 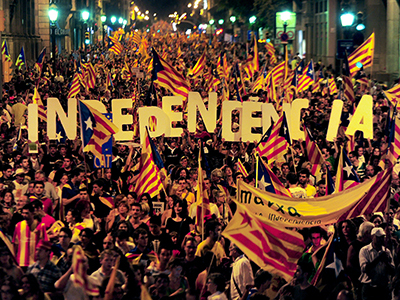 The independence supporters claim they were provoked by the authorities. It is the first time that Barcelona has had an anti-independence demonstration on the Spanish national holiday. "I've come here because of the protest taking place over there, which occurred at another more distant location in other years. 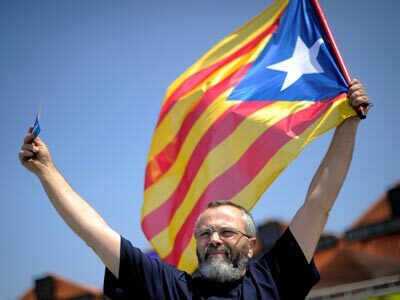 It goes against the will of the Catalan people, which claims its right to self-determination and the right we have to choose if we want to become a country within the European Union and the world," one pro-independence protester claims. The National Day march was organized under the ''Catalonia is all of us'' slogan and included politicians of the center-right People's Party and constitutional parties like Ciutadans. About 6,000 people from different Spanish provinces came out to counter the general anti-Spanish sentiment in Catalonia, which on its National Day of Catalonia attracted over 1.5 million people. Today’s symbol of the movement was a heart broken in two, with a Spanish flag in one half and a Catalan flag in the other. Some would say it represents today’s battle between Madrid and Barcelona. 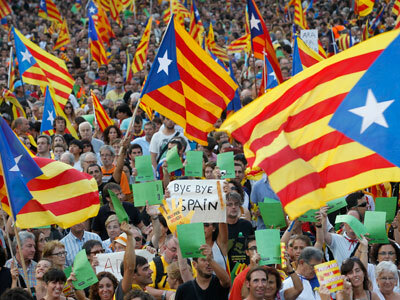 On Tuesday, the Spanish Parliament blocked a bid by Catalonia for secession. The motion to permit a referendum on the matter was voted down by the ruling conservatives, which hold an absolute majority, and the opposition Socialists. 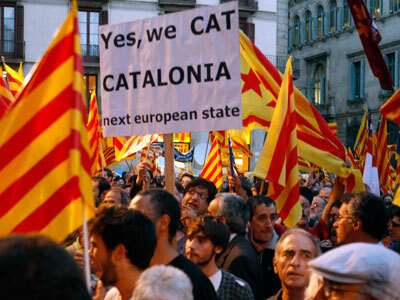 Unemployment, financial instability and austerity measures imposed by the central government have made more than half of Catalans say they want a separate state. Many Catalans complain that they regularly pump money into the central government’s coffers and receive little in return. Their anger stems from the fact that Catalans regularly pay $15-20 billion more in tax revenues than they receive in social spending and investment in infrastructure. October 12 is celebrated as the day Christopher Columbus discovered America in the name of the Spanish Crown.